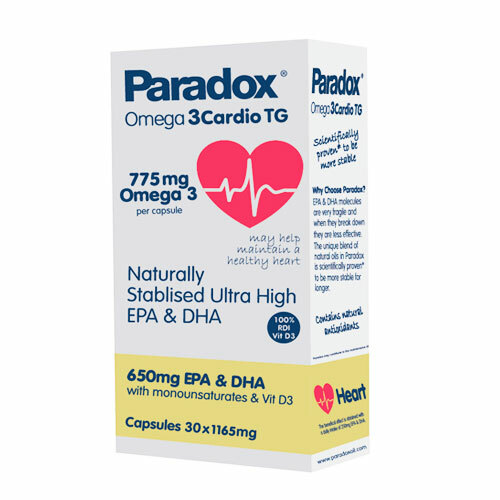 Paradox Omega 3Cardio TG contains a unique blend of naturally stabilised Omega 3 fatty acids designed to maintain a healthy heart and circulation. Paradox contains essential fatty acids which may improve the nutrition of the skin and associated inflammatory conditions. It also supports brain, eye, heart and joint health. EPA and DHA are essential Omega 3 fatty acids. This means that they cannot be manufactured in the body and can only be obtained from your diet or supplementation. Paradox is the perfect supplement to ensure that your body obtains these essential nutrients. Pure Fish Oil, Pure Extra Virgin Olive Oil, Pure Organic Lemon Oil; Capsule: Fish Gelatin BP, Glycerol BP. One capsule a day taken after food, preferably in the morning. Food supplements should not be used as a substitute for a healthy, varied diet. If you are taking warfarin or a similar anticoagulant consult your doctor. Pregnant or lactating women should consult their doctor before taking any mineral or vitamin supplements. 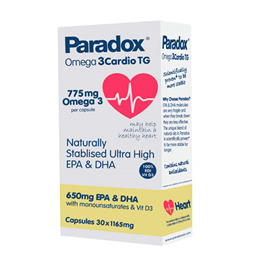 Below are reviews of Paradox Omega 3Cardio TG - 30 x 1165mg Capsules by bodykind customers. If you have tried this product we'd love to hear what you think so please leave a review.